This Irish ornament features a dimensional design. Irish Christmas ornament features dangling charms that include a shamrock and pot o’ gold along with a horseshoe. 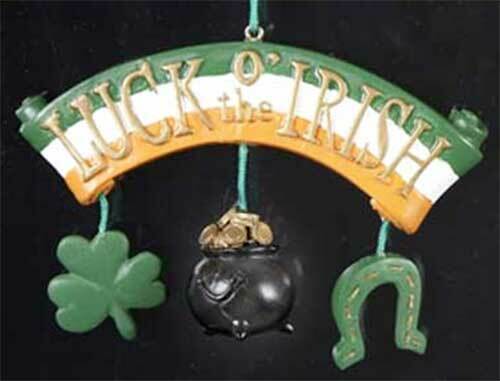 The Irish ornament is further enhanced with a rainbow banner that says, Luck o' the Irish. The Irish charm ornament measures 4" wide x 2.5" tall; it is ready to hand with the included green string. The luck o' the Irish ornament is made of resin by KSA; it is gift boxed with a shamrock history card, complements of The Irish Gift House.